Sometimes all you need is to laugh at a good old-fashioned comedy. 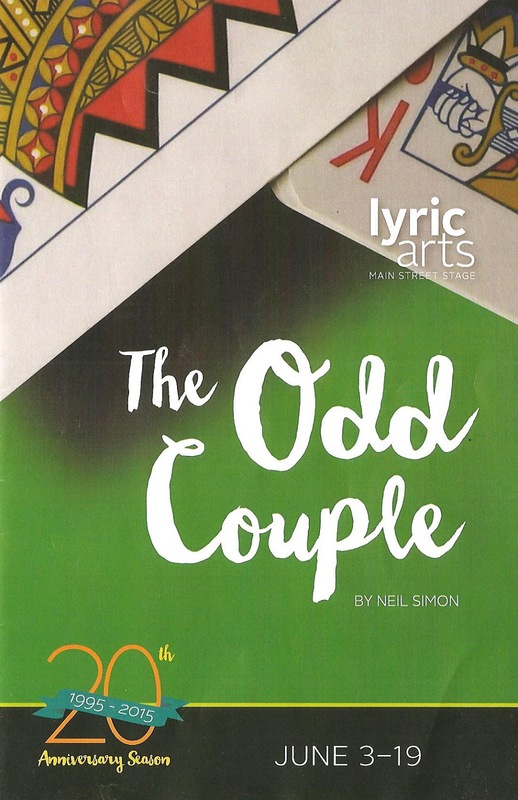 Neil Simon's 1965 play The Odd Couple fits the bill. Yes, it's a "first world problems" kind of play, and the depiction of women as playthings is problemantic in today's world. But there's a reason it had such long-lasting success (it was made into not just a movie, but also a TV sitcom and a recent reboot). The reason being that Simon's sharply drawn characters and fast witty dialogue are just plain funny. And yes it's been done a lot, but Lyric Arts' production makes this old chestnut worth seeing again with their perfect casting, spot-on direction, and fantastic set. 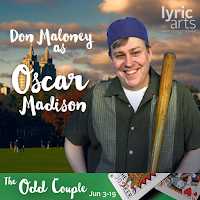 So take a trip back to 1960s NYC and have a good time with "divorced, broke, and slobby" Oscar and his reluctant roommate Felix, who "wears a seat-belt at a drive-in movie." 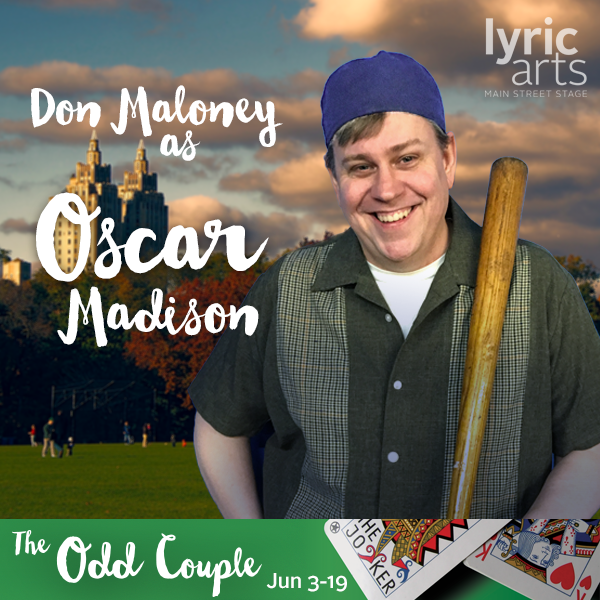 I'm not sure Lyric could have found a more perfect Oscar/Felix pair than Don Maloney and Bill Williamson. Both thoroughly embody the laid-back slobbiness/nervous fastidiousness of their characters. And both give natural and lived-in performances, totally in the moment, reacting to what the other says or does. Part of the fun is watching each watch the other. Bill (who recently returned to the stage after nearly 20 years - welcome back, sir!) is particularly endearing and imbues Felix with a jittery physicality as he slides across the floor, doing double takes, constantly wiping his brow. The supporting cast is just as great playing the four specifically typed poker buddies (Christopher Zanetti, David Vandergriff, Rick Wyman, and Steve Florman) and the giggly Pigeon sisters (Allison Hawley and Caitlin Wilkey). They make a great sitcom ensemble under the direction of Daniel Ellis, keeping the tone light and the pace quick. Making his debut as a scenic designer at Lyric Arts, Travis Collins really knocks it out of the park with this fantastic depiction of a NYC apartment in the '60s. The extra-tall walls house big windows and high narrow shelves cluttered with sporting gear, picture frames, and books. Vintage records and magazines add an authentic touch, with clothes and beer bottles littering the two-level set, quickly cleaned up by stagehands in maid costumes during the first intermission (prop design by Emma Davis and Lauren Welle). '60s mood music before the show and during intermissions (there are two, but don't worry the run time is just over two and a half hours and feels shorter) sets the tone of the show. Honestly I almost didn't see this one, because I so enjoyed The Odd Couple at the Theatre formerly known as Bloomington Civic (with dream casting) two years ago. But I'm very glad I did because Lyric does a fantastic job with this classic. If you live in the Northern Metro I highly recommend checking out Lyric Arts for this fun comedy (on stage through June 19, discount tickets on Goldstar), the summer musical Nice Work If You Can Get It (with music by the Gerswhins), or one of the shows in what looks to be an exciting 2016-2017 season. 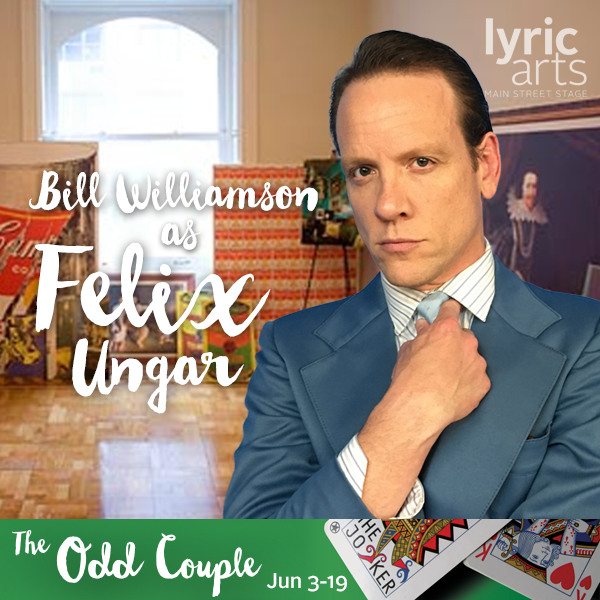 *Plot summary borrowed from what I wrote about the 2014 production of The Odd Couple at Bloomington Civic Theatre. I saw this show on opening night, and it was a lot of fun. The cast has great energy and chemistry, and the audience responded accordingly. The set, sound, and costume design was all quite impressive as well. I highly recommend it for a fun night out.